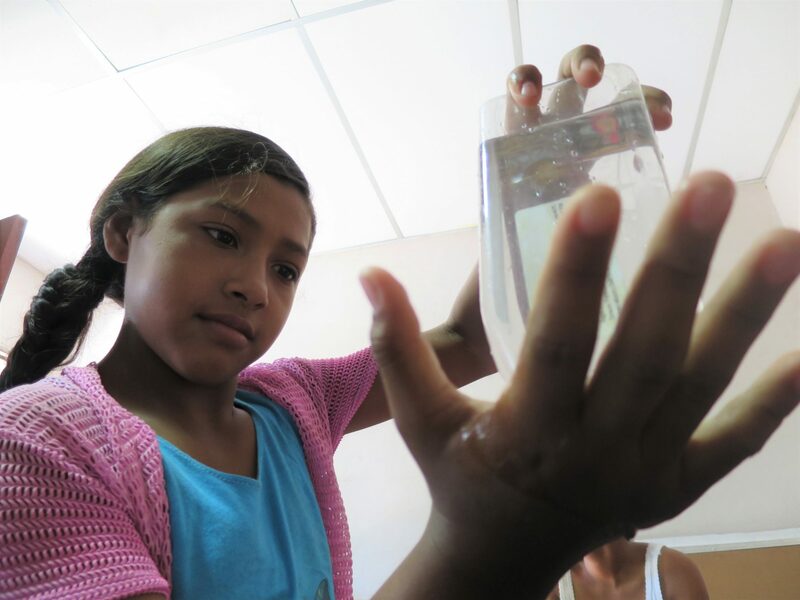 This student conducts an experiment in LUV’s Global Scientists course at NicaPhoto in Nicaragua, where Fernanda spent several months as a Moving Worlds Experteer. She is now helping to implement Level Up Village courses in schools across Latin America. For five months earlier this year, I was an“Experteer” with Moving Worlds, volunteering my professional and personal skills, and traveling, too. I was lucky enough to do it with two different organizations: Level Up Village (LUV) and NicaPhoto, in Nagarote, Nicaragua. My role was to help NicaPhoto promote its educational and personal development programs to families living in one of the poorest barrios of Nicaragua. I also assisted in teaching NicaPhoto’s global STEAM courses, offered through its partnership with Level Up Village on topics such as web design and programming. In these courses, students not only learned leading-edge STEAM skills, but also worked on projects and communicated with partner students in the United States. NicaPhoto’s 21st Century global classroom is a standout in Nicaragua. The country is known as the poorest country in Central America and its education system has suffered the consequences. For many years, young people have shifted from classrooms to the labor market. Only 22% of the country’s young people complete sixth grade and only around 14% of the population enrolls in college. Rather than going to school, many young people help their families make ends meet and have limited career prospects, as a result. Initiatives such as NicaPhoto are trying to change this reality. The non-profit organization assists disadvantaged children and their families through a variety of educational support and enrichment programs. Its programs are helping to improve educational outcomes. In 2014 and 2015, 100% of the students in its enrichment programs also finished the sixth grade in their local schools and eight students have received college scholarships. In Global Sound Artists, children at NicaPhoto built instruments while learning about the science of sound together with partner students in the United States. In addition, more than 200 kids at NicaPhoto, ages 6-16, have participated in Level Up Village courses in the past few years. They have learned new STEAM skills together with partner students around the world, and in the process, they have developed 21st Century skills and become global citizens. Fernanda visits students at Colegio Santa Fe who have recently begun participating in a Level Up Village course. On her visit, she gave pointers to students on how to create effective video messages for their partners in the United States. My experience at NicaPhoto has led me to another terrific opportunity. Now I’m in Mexico working with Latin American schools that have just begun offering Level Up Village programs. These schools are located in Mexico, Colombia and Argentina. Because they all believe in global education and the importance of forming global citizens, they are eager to begin offering LUV courses. I offer training and support to teachers and help them in the classroom as they facilitate their students’ interactions with their global partners. On my classroom visits, students have told me they enjoy making their student profile so they can share more about themselves and their interests with their global partner and that they’re looking forward to meeting their global friend. I have helped them record their first video messages to their partners and answer questions they may have as they begin to collaborate on projects. My goal is to help both students and teacher get the most out of the experience. As a global educator, I’m excited about making new connections and extending the impact of LUV courses to even more students in different parts of the world. It’s amazing when I have to chance to talk to a new teacher, a new group of kids. These encounters help reinforce the fact that we’re all on a journey and that innovative global education opportunities like these will help open doors for students, helping them develop important skills and prepare for a career in the 21st Century global economy. Fernanda helps a student record a video message to his partner in the United States at Secundaria Tecnica Juan Ceballos, in Hermosillo, Mexico. Here Fernanda explains to students at INAM Hermosillo in Mexico how they will collaborate globally in their Level Up Village courses. Fernanda hands off boxes of webcams to teachers at Escuela Técnica Secundaria 12 in Hermosillo, Mexico, so they can send and receive video messages with their partner students in their Level Up Village courses. Fernanda Oliveira: Fernanda is Program Manager for Global Partnerships at Level Up Village and a former Moving Worlds Experteer.